longsoran ditentukan melalui pengukuran dan pengamatan morfometri longsoran untuk menentukan indeks klasifikasi longsoran dan hasil analisis tersebut di plot ke dalam Peta Lokasi Sebaran Tipe Longsoran Skala 1 : 50.000 untuk mengetahui sebaran keruangan dari kejadian longsoran di DAS Alo Provinsi Gorontalo. Berdasarkan analisis morfometri dan indeks klasifikasi longsoran menunjukkan bahwa tipe longsoran yang terjadi adalah rotational slide, planar slide, slide flow dan rock block slide.Kejadian longsoran yang terjadi di DAS Alo Provinsi Gorontalo tersebar pada wilayah dengan kemiringan lereng curam dan sangat curam dengan bentuk permukaan lereng cembung dan cenderung lurus. Kejadian longsoran juga terjadi pada wilayah dengan tekstur tanah lempung dan lempung berlanau, serta jenis batuan vulkanik dan batuan beku yang mengandung silika tinggi dan telah mengalami pelapukan. Berdasarkan wilayah administrasi, kejadian longsoran tersebar di wilayah Kecamatan Tibawa, Kecamatan Pulubala dan Kecamatan Isimu Utara. Kata Kunci:aspek keruangan, daerah aliran sungai, longsoran, sebaran, sungai. 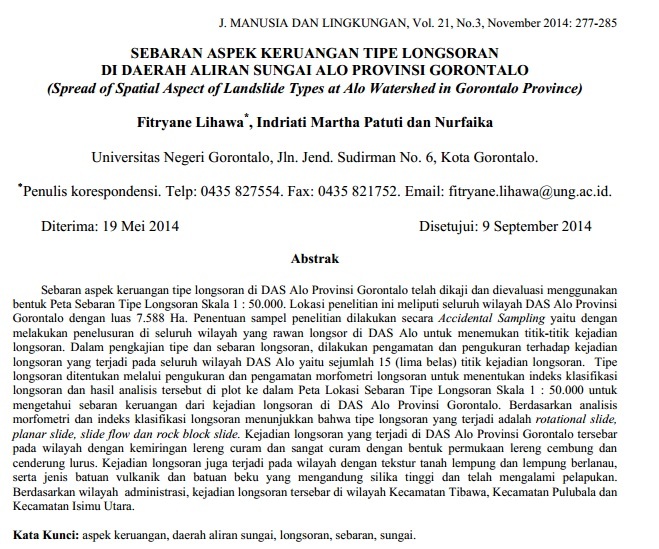 Distribution of spatial aspect of landslide at ALO Watershed of Gorontalo Province has been studied by providing it through form of spread landslide maps at scale of 1 : 50.000. Research site involved all areas of ALO Watershed in Gorontalo Province as having an area of 7,588 Ha. Research sampling was conducted through accidental sampling as exploring all areas across the region prone to landslides at ALO Watershed in order to invent potential spot of landslide occurence. Regarding to the discussion and spread landslide, it was conducted an observation and measurement toward landslide which was occured to all areas of ALO Watershed 15 number spots of landslide occurance. Type of landslide was determined by the measurement and observation of landslide morphometry toward classification index and analysis result. Then it was distributed into the map of spread landslide at scale of 1 : 50.000 in rder to acknowledge the spatial spread of landslide occurence at ALO Watershed in Gorontalo Province. Based on the morphometry analysis and classification index of landslide, they showed that landslide types are rotational slide, planar slide, slide flow, and rock block slide. Landslide occurence of ALO Watershed in Gorontalo Province has been spread in areas with steep slope and very steep slopes by having convex surface shape and tend to be straight. It also occures to the area of clay texture and silted loam, and types of volcanic and igneous rocks which contained high silica and encountering weathering. Regarding to the administration area, landslide occurence is spread to the subdistrict of Tibawa, Pulubala, and Isimu Utara subdistricts. Keywords: landslide, river, spatial aspect, spread, watershed.